In 2013, I’ve featured American Academy of Dermatology (AAD)’s Dermatology A: Z Videos (here). Since then, AAD has added several other videos which are informative and practical. AAD’s public relations team has once again been most helpful in introducing me to the dermatologists who assisted with my questions, making it possible to bring this special AAD Dermatology A:Z video series to you! The video covered today is “How to Shave”. For this video, I interviewed Dr. Thomas E. Rohrer, M.D., who is a dermatologic surgeon at SkinCare Physicians, and previously served as the Chief of Dermatologic Surgery at Boston University Medical Center and Boston Veterans Administration Hospital for eight years and as the Director of the Boston University Center for Cosmetic and Laser Surgery. Dr Rohrer is passionate about education and is the editor of six cosmetic and laser surgery textbooks and guest editor of numerous journals. MarcieMom: Dr Rohrer, thank you for helping out in this AAD video series. Shaving is something most men and women have to do regularly and it is not as simple as it looks – complications can arise from shaving and shaving can be complicated for those with existing skin conditions. We’d first cover how to shave safely and what those with eczema have to pay attention to when shaving. I read that wetting the facial hair will allow it to absorb the moisture and a swollen hair is softer and easier to cut. It appears that warm water is best, either a few minutes from a moistened towel or after shower. I also come across that showering will open up the hair follicle and makes it easier to shave. The idea is that the easier it is to shave, the more likely a one-time pass is sufficient and thus, less likely to irritate the skin. Conversely, showering too long will cause the skin to wrinkle and harder to shave. Dr Rohrer: You are correct; when hair is wet, it absorbs a little water and becomes softer. This allows the razor to cut the hair more easily. In general, things expand when they are warmed. So using warm water will expand the hair, skin, and pores more than cold water. This allows more water to be absorbed into the skin and hair and makes the hair softer than if cold water was used. In addition, water in and of itself is a slight lubricant so it helps the razor glide over skin better than dry skin. It is difficult to wet the skin on the face, underarms, or legs too much. These areas do not tend to get bloated like the fingers may after long water exposure. MarcieMom: Likewise for the application of shaving cream or gel, there appears to be ‘good practices’ such as leaving the shaving cream on the skin for 3 minutes, brushing the cream into the hair with a shaving brush to lift the hairs and to ensure that the hairs get coated with the cream. Is a shaving cream necessary for all parts of the body or only facial hair for men? If lubricating is the main purpose of shaving cream, will showering with bath oil achieve the same purpose? Is there an issue of too much shaving cream? Dr Rohrer: I don’t think one can use too much shaving cream. The point of a shaving cream is to soften the skin and hair and act as a lubricant and barrier between the razor and the skin. If someone does not experience discomfort when using bath oils in the shower then that would be fine to use. If they do have some irritation then they could add a shaving cream or gel. Act of shaving – irritation from friction, damage to epidermis, or repeated shaving? 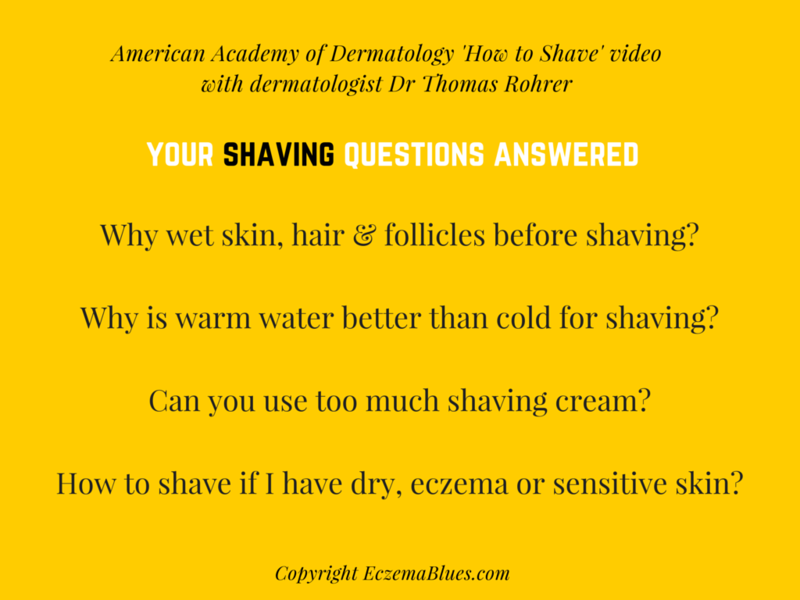 MarcieMom: Dr Rohrer, what should someone with sensitive skin take note of when shaving? Dr Rohrer: Shaving foams out of a store bought can contain a great deal of alcohol and can dry the skin out. If someone has sensitive skin it makes sense to use a shaving gel, cream, or soap. These products contain more glycerin than alcohol and do not dry the skin out. It is also important to moisturize the skin right after shaving. Men should use a moisturizer that contains sunscreen with an SPF of 15 or 30 in it. This will give a good base coat on the face every morning. One issue with dry shaving is that the razor may get clogged up with dead skin cells. A clogged razor doesn’t give a close shave and there is a risk of nicks. For those with dry skin or eczema, there may be more dead skin cells. Also shaving can cause micro-tears in the skin and eczema patients may get the micro-tears more easily or more prone to infection at the micro-tears. MarcieMom: Dr Rohrer, should shaving over skin that has active eczema flare-up be avoided? What should an eczema sufferer take note of during shaving? Dr Rohrer: If someone has eczema or any other skin condition, it should be treated and controlled medically. There are great treatments for these diseases that can get them under control. The AAD is a wonderful resource for people to use to get more information about their particular condition. If there is a flare-up, then caution should be used when shaving over these areas. An electric razor is less likely to cut skin than a typical blade razor. These devices can be used in areas that have been compromised by a dermatologic condition. Moisturizing after shaving will also help. Thank you Dr Thomas for helping us to understand shaving and how preparation is important. For those of us with eczema or sensitive skin, it is also most helpful to understand how shaving affects our skin.